This weekend the Cayuga Dragway of Toronto Motorsports Park will host the biggest show of its kind in Canada. The eighth annual Canadian Nitro Nationals will be held on the Kohler Road strip outside of Cayuga, promising more quarter-mile action than in previous years. As part of the PCRichard.com NHRA Northeast Division National Open Series, the much anticipated Stock/Super Stock Shootout returns June 16, 17 and 18, to the Toronto Motorsports Park in Cayuga, Ontario. Vintage Chevrolet Super Stock racer Pete D’Agnolo (from Rochester), grabbed the top event headlines for the PCRichard.com NHRA Northeast Division National Open Series race held at Cayuga Dragway for both June 17 & 18th when he completed an undefeated weekend sweep of the event’s highlight Stock/Super Stock Shootout, presented by John Scotti Classic Cars and the Canadian Drag Racing Hall of Fame. Congratulations go out to Pete D’Agnolo of Rochester, NY, who won days one and two of the John Scotti Classic Cars/CDRHF.com $25,000 USD Stock/Super Stock Shootout. His winnings for the two days totalled $12,000 USD. Runners-up were John Armstrong of Kingston, Nova Scotia and Venice Perno of Stoney Creek, Ontario whose share of the Shootout cash was $2,000 USD each. The results are out for the PCRichard.com NHRA Northeast Division National Open Series for Super Gas, Super Street and Super Comp and the Stock/Super Stock Shootout that took place June 17 and 18, at the Toronto Motorsports Park in Cayuga, Ontario! The Stock/Super Stock Shootout returns June 16, 17 and 18, to the Toronto Motorsports Park in Cayuga. This year’s event, which includes two races, has a total purse of $25,000 US and is part of the PCRichard.com NHRA Northeast Division National Open Series. Drivers from Connecticut, Florida, Indiana, Michigan, New York, Ohio, Ontario, Quebec and Atlantic Canada will compete in the Shootout. 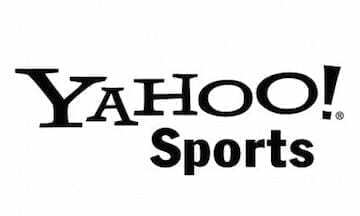 As part of the PCRichard.com NHRA Northeast Division National Open Series, the much-anticipated Stock/Super Stock Shootout returns June 16, 17 and 18, to the Toronto Motorsports Park in Cayuga, Ontario. This year’s Stock/Super Stock Shootout returns to the Cayuga Dragway of Toronto Motorsports Park this weekend, and once again will offer a huge payout for these two classes of drag racing. STOCK / SUPER STOCK SHOOTOUT RETURNS TO TMP! Three new NHRA national record holders will compete at the event. They are Yves Perigny and Canadian Drag Racing Hall of Fame inductees Guy Desjardins and Ollie Stephan who set national records at the PCRichard.com NHRA Northeast Division One National Open in May, in Atco, NJ. Hockey may be Canada’s favorite sport, but drag racing isn’t far behind in terms of popularity and interest. The Canadian Drag Racing Hall of Fame welcomed its second class of inductees Saturday in Montreal. For most of his life, Norm Noddle has found meaning in the exhaust of fast cars. 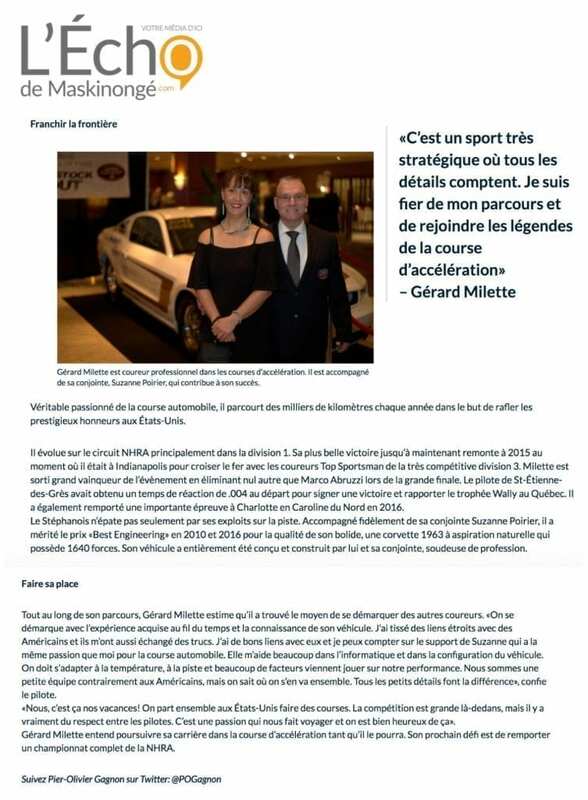 Achs was inducted into the Canadian Drag Racing Hall of Fame in Montreal on October 15th. Saskatoon’s Ken Achs was one of the Canadian Drag Racing Hall of Fame inductees honoured this past weekend to recognize their achievements in the sport. Photographer and announcer Rob Potter was honoured last weekend for his “generosity and contributions” to the sport of drag racing. Venice Perno has been honoured for his performance on and off the drag racing track. 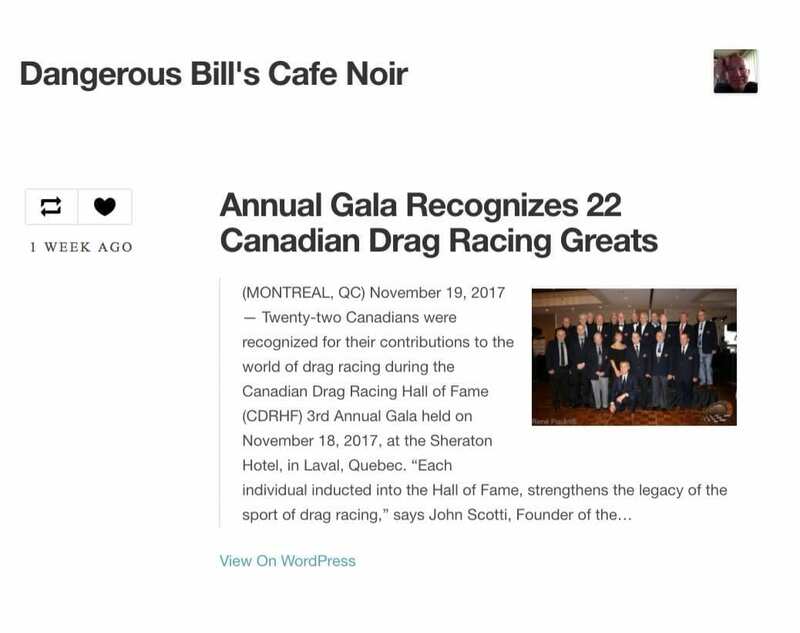 Twenty-three of Canada’s drag racing legends were inducted into the Canadian Drag Racing Hall of Fame at the Second Annual Gala held at Hotel Universel in Montreal, on Saturday, October 15. 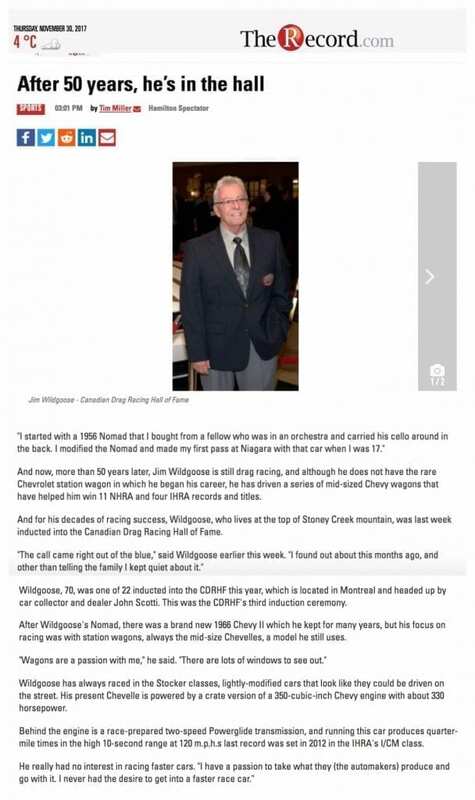 A Red Deer drag racer was inducted into the Canadian Drag Racing Hall of Fame in Montreal last week. 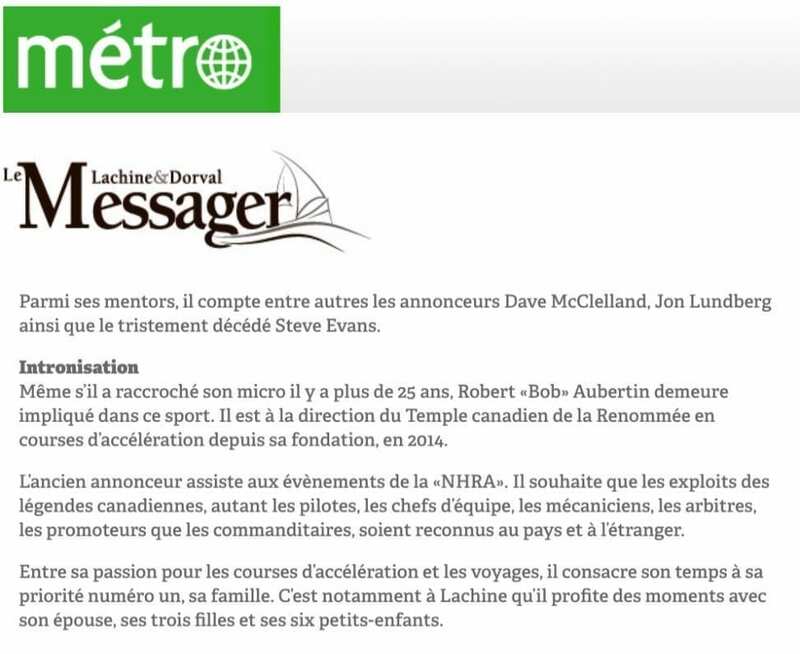 A pair of Southern California residents, Jeff Arend and Rob Evans, were among the 23 persons inducted into the Canadian Drag Racing Hall of Fame on Saturday in Montreal for their significant achievements and contributions to the sport. After 40 years behind the wheel of hot rods, Abe Loewen is being inducted into the Canadian Drag Racing Hall of Fame. Growing up in Canada, hockey was a way of life for Jeff Arend. He competed in the sport from age 6 to 17. 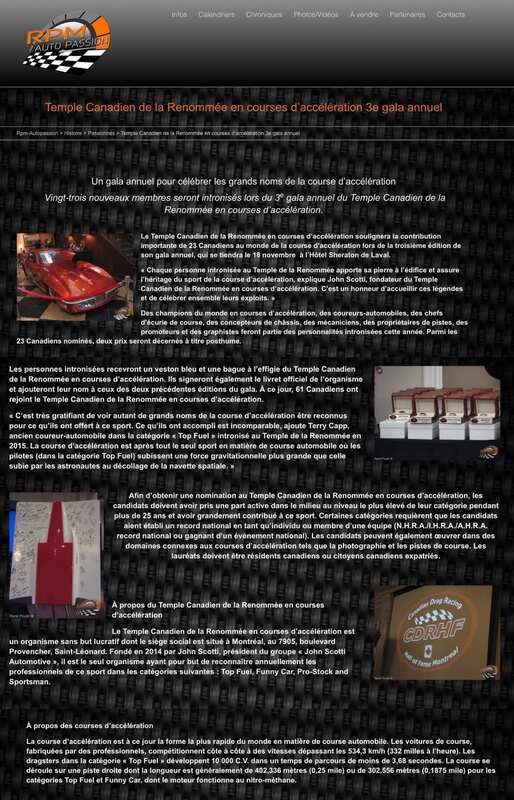 Arend, however, was intrigued with motorsports and eventually took that path. 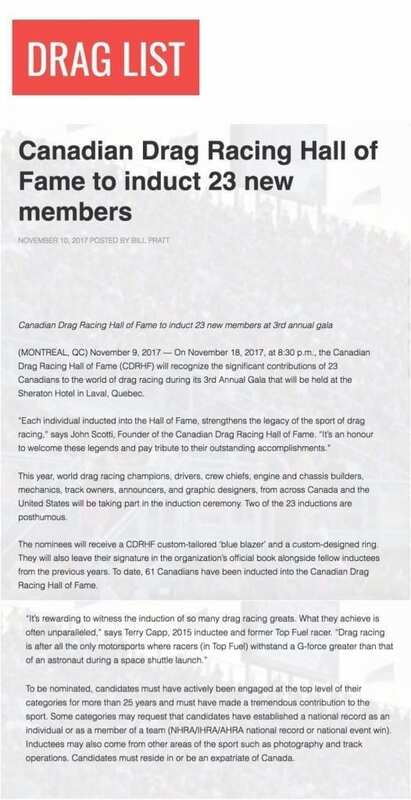 Twenty-three drag racing legends from across the country will be inducted into the Canadian Drag Racing Hall of Fame at the Second Annual Gala starting at 5:30 p.m., on Saturday, Oct. 15, in Montreal. 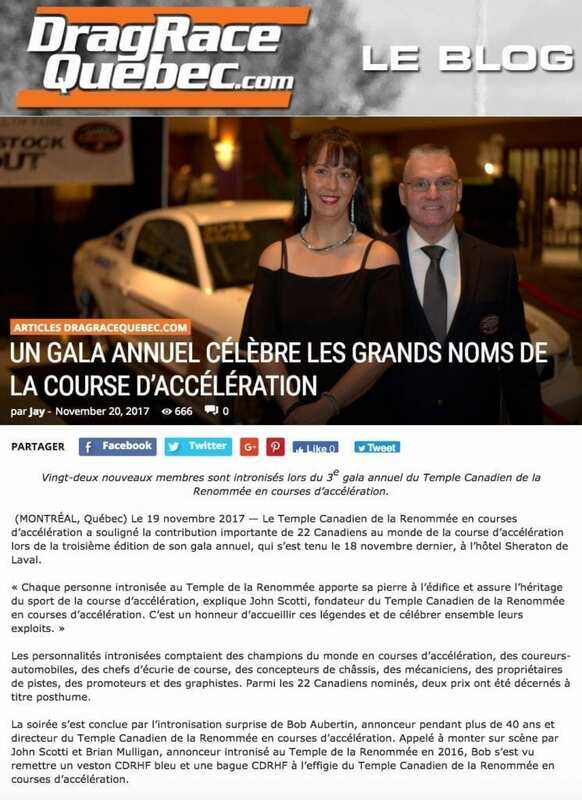 Vingt-trois légendes canadiennes en courses d’accélération ont été intronisées au Temple Canadien de la Renommée en courses d’accélération lors du 2e gala annuel. 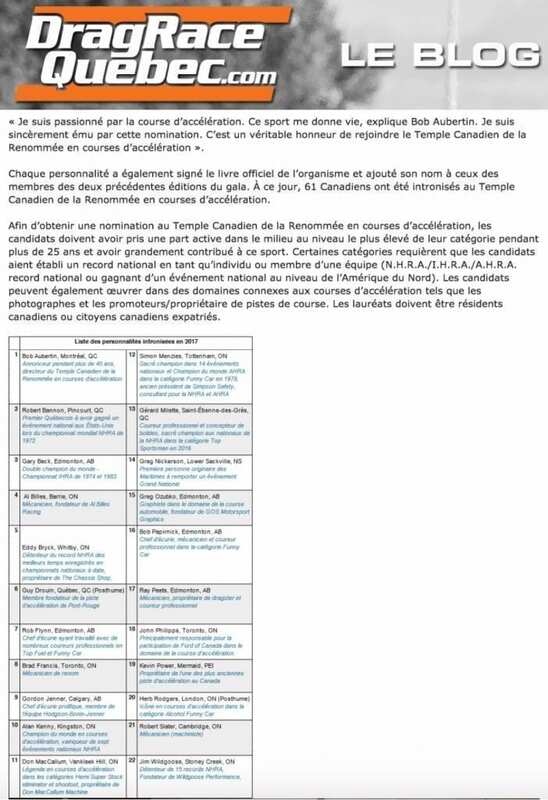 Vingt-trois légendes canadiennes en course d’accélération ont été intronisées au Temple Canadien de la Renommée en course d’accélération lors du 2e gala annuel à l’Hôtel Universel de Montréal, le samedi 15 octobre dernier. To say oil and gas run in Bert Straus’ veins would be an understatement.Even in semi-retirement, he finds solace in working on other peoples’ cars in his small garage in an industrial park in north Waterloo. Charlie Haviland’s need for speed took him from a Wilsonville dairy farm to the Drag Racing Hall of Fame. 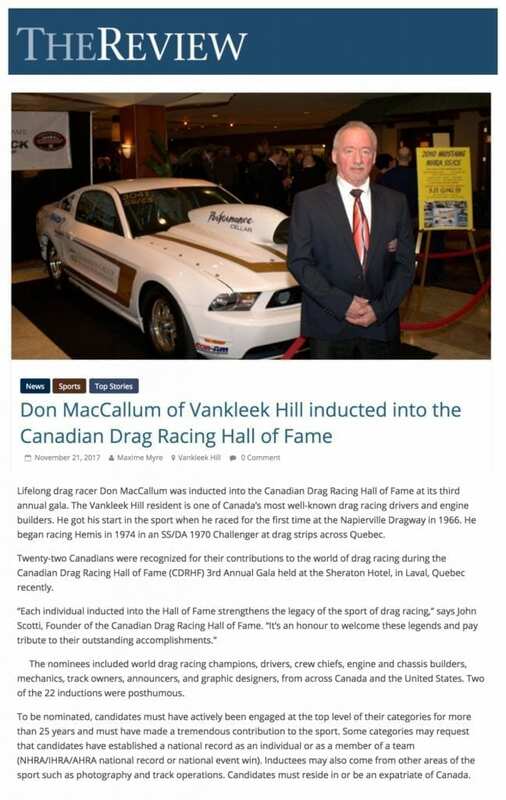 Five drag racing legends from London earned prestigious blue blazers following their induction into the Canadian Drag Racing Hall of Fame at a gala event in Montreal October 15. Charlie Haviland is a prime example of just how far – and fast – passion can take you. 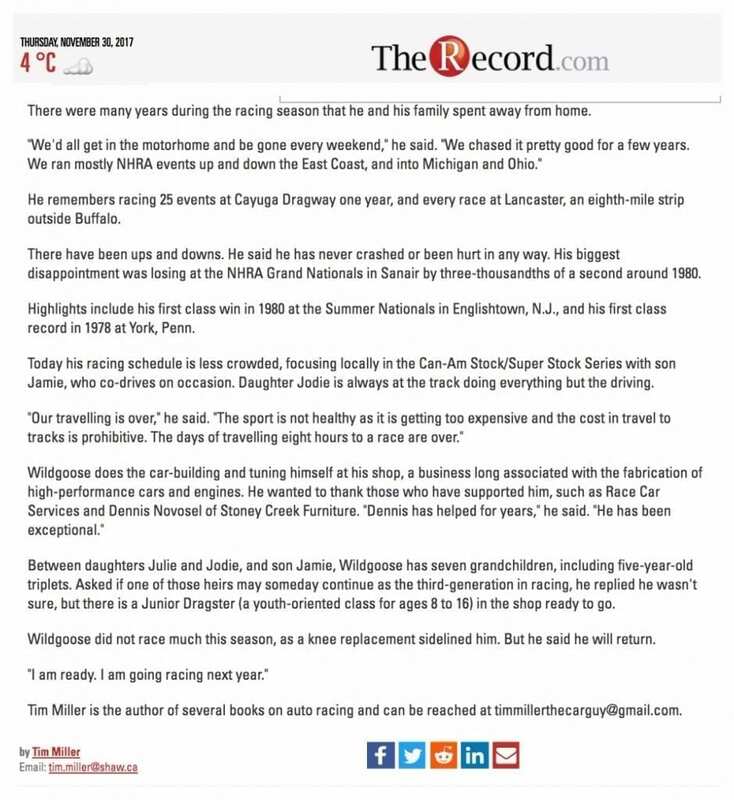 The Wilsonville native is recognized within the North American drag racing community as an innovator, pioneer and leader. Vince launched his formidable drag racing career in 1961. 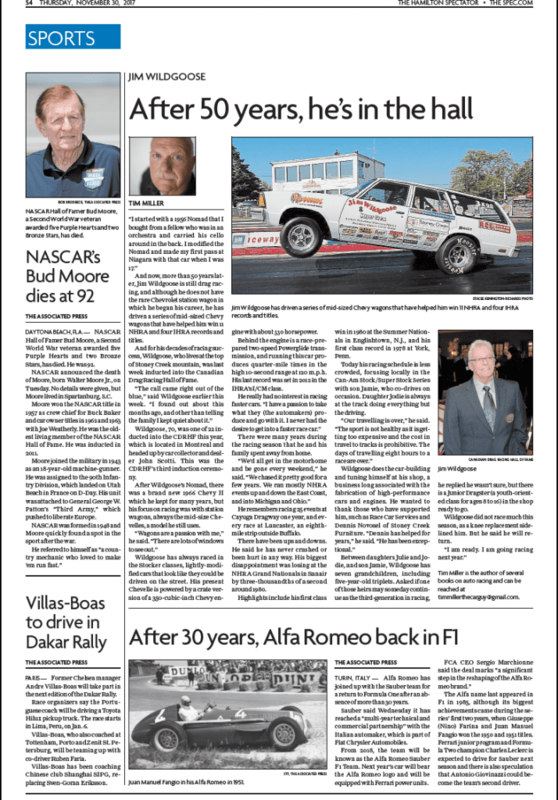 In October of this year, the Falmouth resident was inducted into the Canadian Drag Racing Hall of Fame. 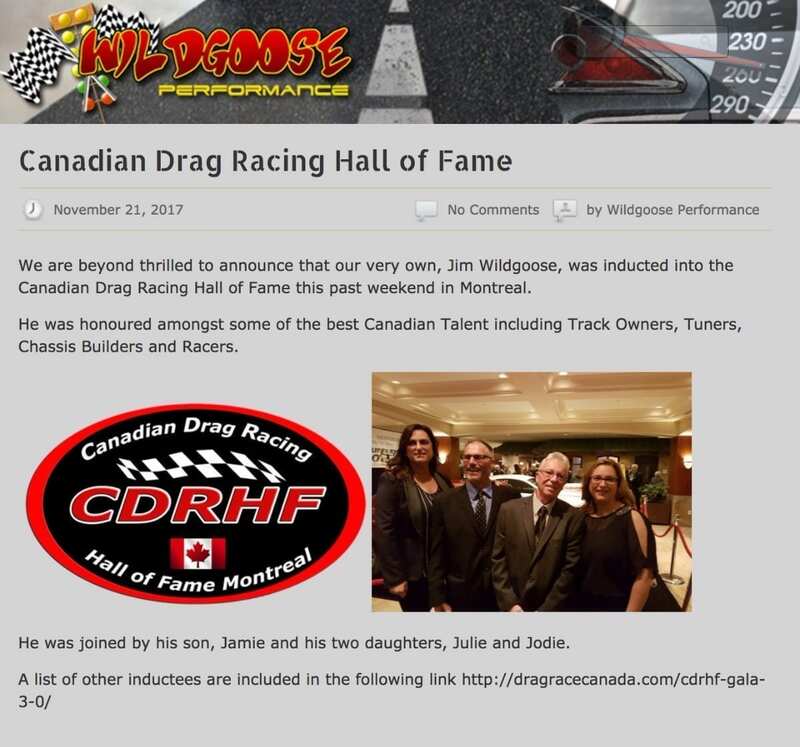 The official induction took place at the Second Annual Canadian Drag Racing Hall of Fame Gala in Montreal on October 15 in recognition of his achievements in the sport of drag racing. Potter, Perno and Straus go into Canadian Drag Racing Hall of Fame. It was a call he never expected. The call came a few months ago. “I am sitting here, still in shock from a phone call from the Canadian Drag Racing Hall of Fame,” said Dundas native Rob Potter. 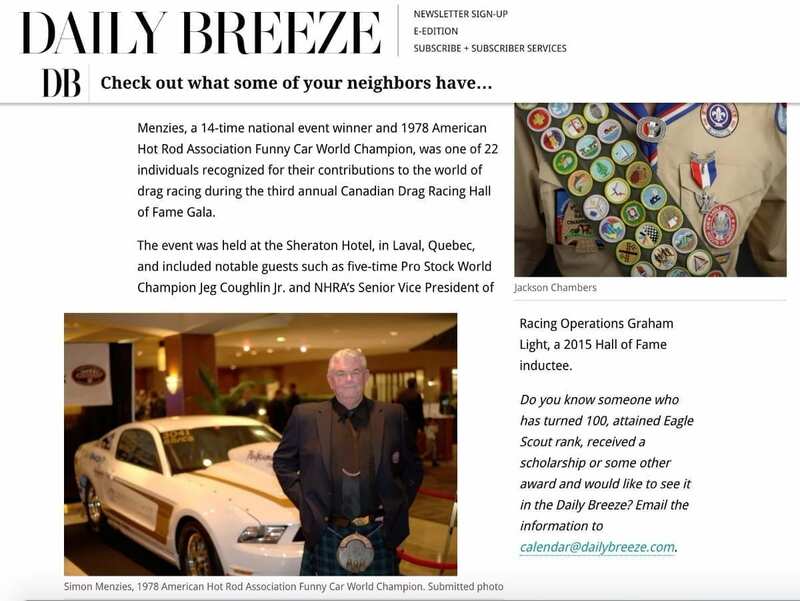 NHRA Senior Vice President-Racing Operations Graham Light was one of 38 luminaries honored Oct. 9 as an inaugural inductee into the Canadian Drag Racing Hall of Fame in Montreal. 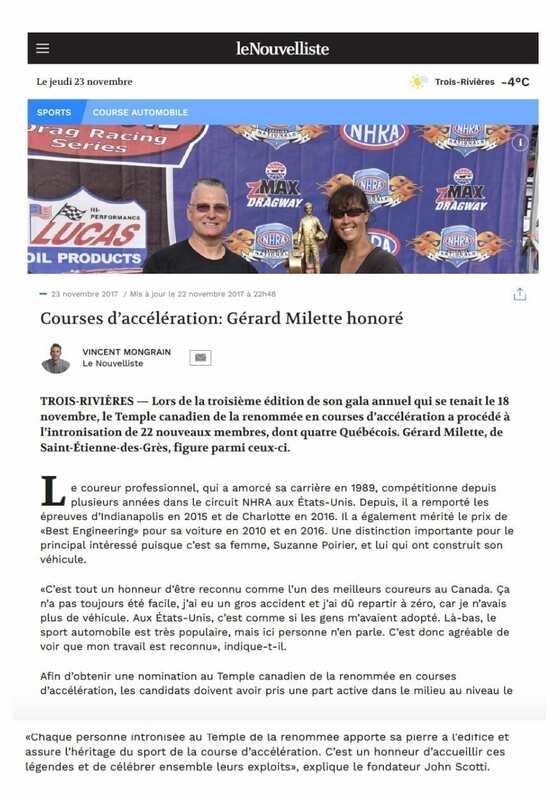 A Prince Edward Islander was one of 38 people honoured at the inaugural inductions into the Canadian Drag Racing Hall of Fame in Montreal last weekend. 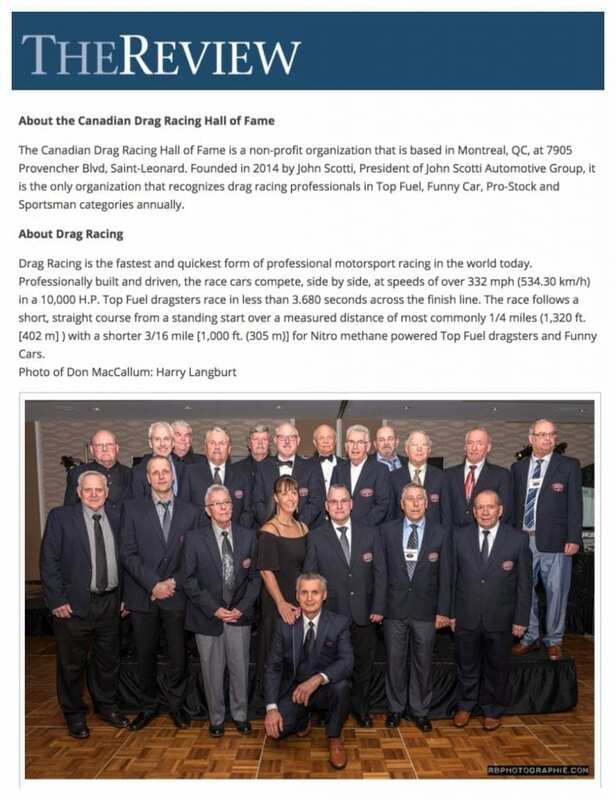 Inaugural Induction Gala for Canadian Drag Racing! 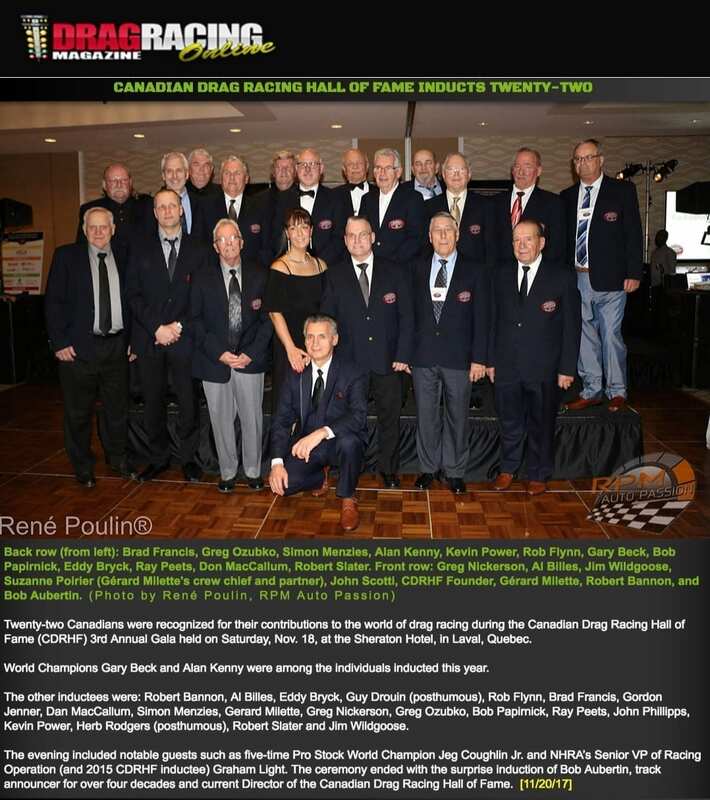 MONTREAL – Thirty eight of Canada’s drag racing legends were inducted into the newly formed Canadian Drag Canadian Hall of Fame inductees Racing Hall of Fame at the inaugural Gala held at the Hotel Universel in Montreal. 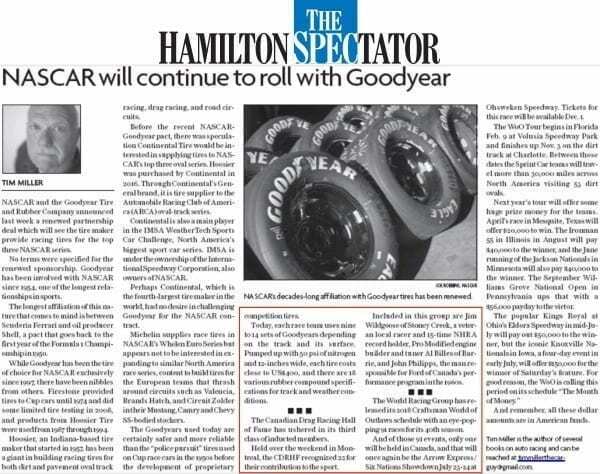 They didn’t have sponsors, but they built a series of record-setting dragsters in their basement and burned up drag strips through Ontario, Quebec and the U.S. Eastern seaboard. Jim and Dan Rini wanted to go racing more than half a century ago and single-handedly put Eastern Ontario’s Mohawk Drag Strip in Deseronto on the map. Just like us, our neighbors to the north really have a thing for drag racing. 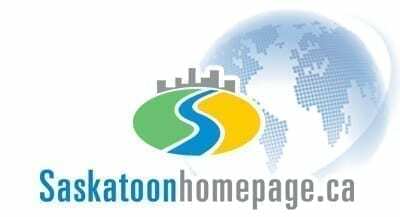 It’s got a long history that spans virtually all of the Canadian provinces and territories. 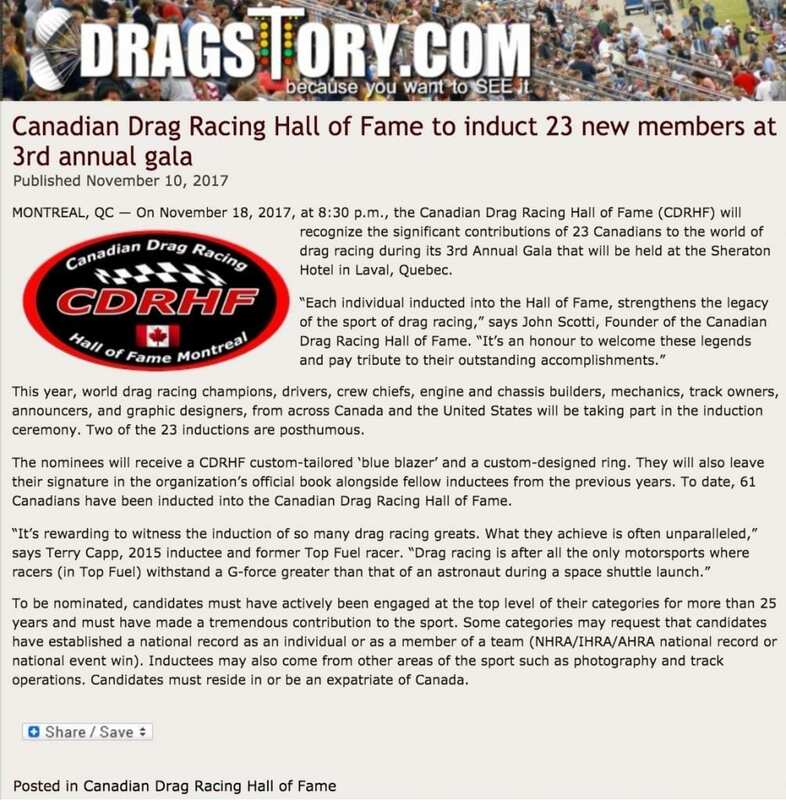 The organizers readily admit that Canada has been ready for a long time to have its own hall of fame for drag racers. The Victoria developer and president of Cielo Properties, who is about to change the face of Government Street with his latest project, used to strap himself into top-fuelled vehicles primed to race a quarter-mile at speeds about 500 kilometers an hour. 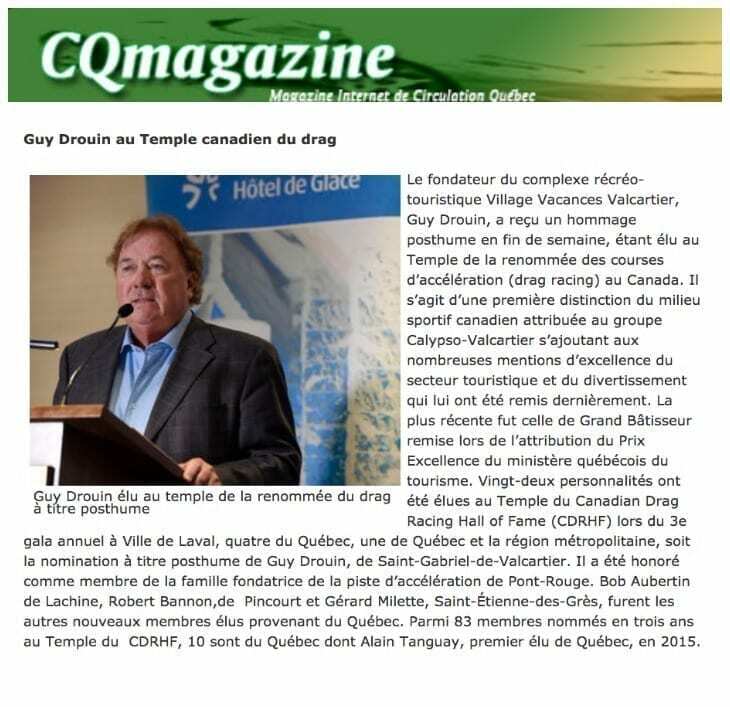 Dans son local de la rue Lanaudière de Repentigny, Jacques Marier est bien assis dans son siège. 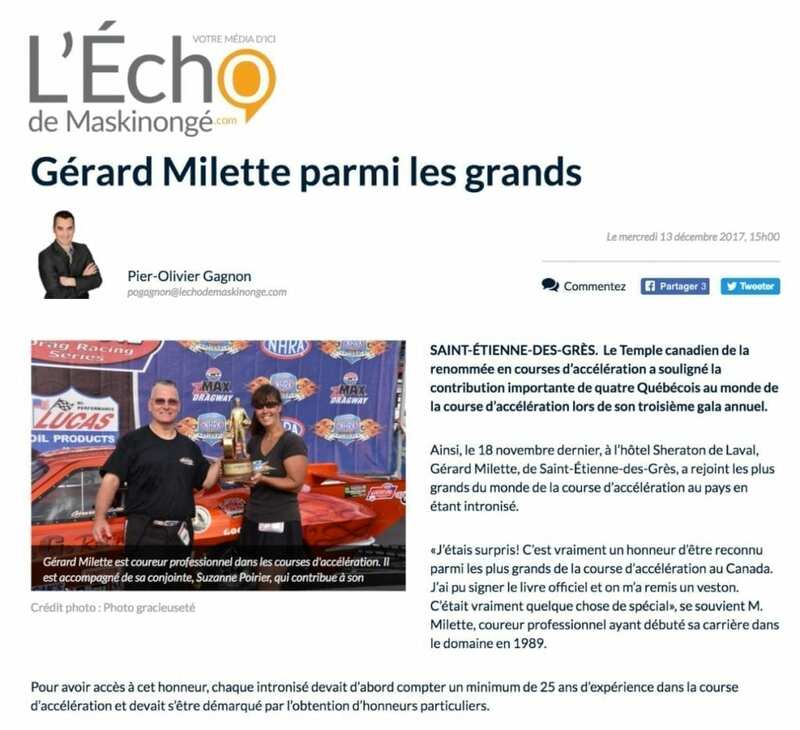 Il parle avec passion de son métier peu banal, car à 67 ans il est toujours pilote de course. 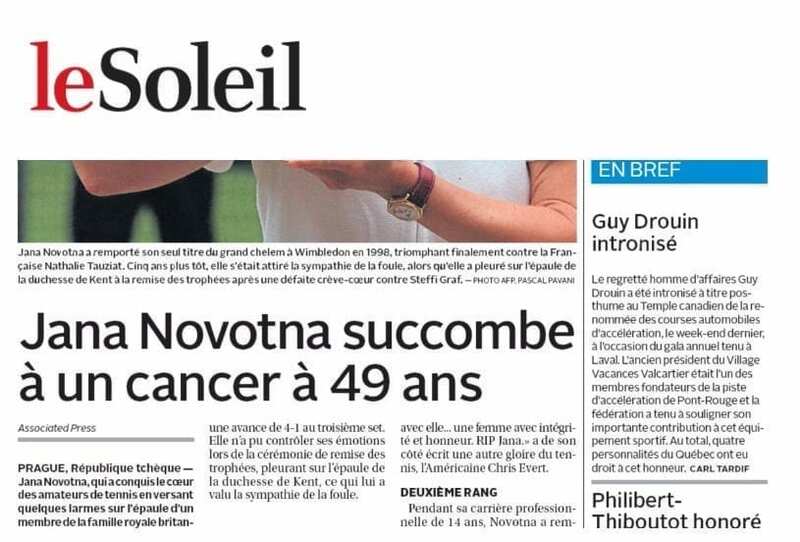 Et à l’écouter parler, il sera pilote pour encore longtemps. Graham Light, NHRA’s senior vice president of racing operations, was one of 38 luminaries honored Oct. 9 as an inaugural inductee into the Canadian Drag Racing Hall of Fame in Montreal. 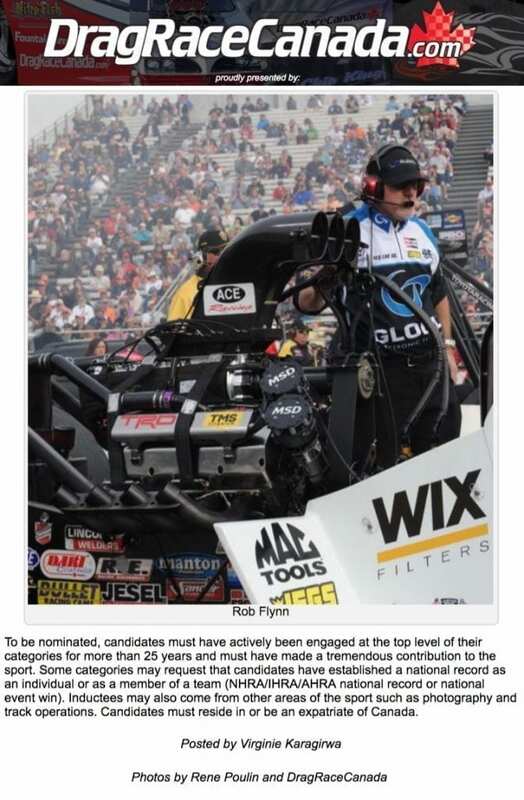 Light, who is from Edmonton, Alberta, started as a driver in Competition Eliminator and then Top Fuel. He also owned and operated the Edmonton International Speedway from 1974 to 1982.